If you thought you were excited for football season before, just wait. Just wait! Now every day can be Sundae thanks to Perry’s Ice Cream and their new Sundae at the Ralph flavor with the Buffalo Bills! 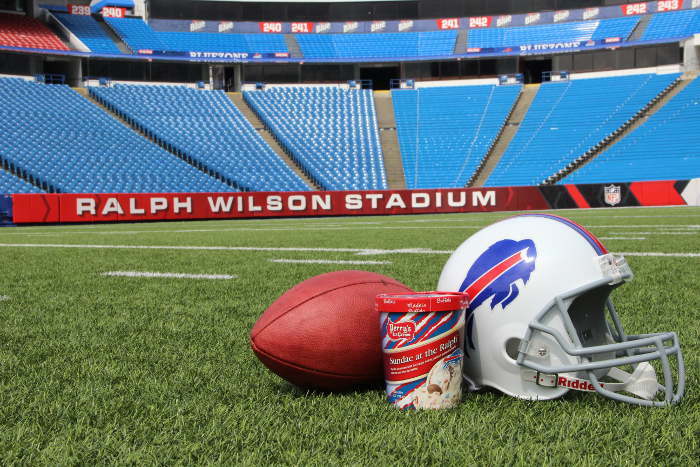 Thanks to an epic collaboration between Buffalo-based Perry’s Ice Cream and the Buffalo Bills, a brand new premium ice cream flavor, Sundae at the Ralph, has been born. The new flavor celebrates our region’s passionate love for the Bills through a Zubaz-themed vanilla ice cream with hot fudge swirls, peanut butter footballs, and red and blue sprinkles. Even the packaging is a 90’s throwback homage to the world’s greatest fashion trend, the iconic Zubaz pants, and comes with a special bonus “Letter to the Fans”. The ‘fan-centric’ flavor celebrates the history of dedication of Buffalo sports fans and the anticipation each new season brings us. Perry’s Sundae at the Ralph is available now and through the 2016 Bills season wherever Perry’s ice cream is sold. Relive the 90’s and celebrate the Bills every day – find your nearest Perry’s vendor and have yourself a Sundae at the Ralph!